A necktie, or simply a tie, is a long piece of cloth, worn, usually by men, for decorative purposes around the neck, resting under the shirt collar and knotted at the throat. Variants include the ascot tie, bow tie, bolo tie, zipper tie, cravat, Knit Tie and clip-on tie. The modern necktie, ascot, and bow tie are descended from the cravat. Neckties are generally unsized, but may be available in a longer size. In some cultures men and boys wear neckties as part of regular office attire or formal wear. Some women wear them as well but usually not as often as men. Neckties can also be worn as part of a uniform (e.g. military, school, waitstaff), whereas some choose to wear them as everyday clothing attire. Neckties are traditionally worn with the top shirt button fastened, and the tie knot resting between the collar points. There is a long history of neckwear worn by Persian soldiers, whether as part of a uniform or as a symbol of belonging to a particular group. Some form of neckwear other than the outdoor scarf can be traced intermittently through many centuries. Historical studies indicate that the Croats started migrating from the Iranian homeland to Croatia, Serbia and Bosnia about 3,000 years ago. However, a much larger migration took place about 1,700 years ago. The believed explanation for this migration was the suppression of the followers of Manichean faith during the Sassanian era. The early immigrants called themselves Khoravat or Croat in order to distinguish with other tribes of that region. These Iranian-origin immigrants also did something more to stress the difference: they tied a handkerchief around their necks, something which later gained global popularity under the name of Cravat. The modern necktie that spread from Europe traces back to Croatian mercenaries serving in France during the Thirty Years' War (1618–1648). These mercenaries from the Croatian Military Frontier, wearing their traditional small, knotted neckerchiefs, aroused the interest of the Parisians. Because of the difference between the Croatian word for Croats, Hrvati, and the French word, Croates, the garment gained the name cravat (cravate in French). The boy-king Louis XIV began wearing a lace cravat around 1646, when he was seven, and set the fashion for French nobility. This new article of clothing started a fashion craze in Europe; both men and women wore pieces of fabric around their necks. From its introduction by the French king, men wore lace cravats, or jabots, that took a large amount of time and effort to arrange. These cravats were often tied in place by cravat strings, arranged neatly and tied in a bow. The Battle of Steenkerque took place in 1692. In this battle, the princes, while hurriedly dressing for battle,[dubious – discuss] wound these cravats around their necks. They twisted the ends of the fabric together and passed the twisted ends through a jacket buttonhole. These cravats were generally referred to as Steinkirks. In 1715, another kind of neckwear, called "stocks" made its appearance. The term originally referred to a leather collar, laced at the back, worn by soldiers to promote holding the head high in a military bearing. The leather stock also afforded some protection to the major blood vessels of the neck from saber or bayonet attacks. General Sherman is seen wearing a leather stock in several American Civil War-era photographs. 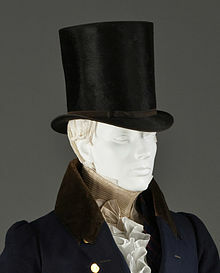 Sometime in the late 18th century, cravats began to make an appearance again.[where?] This can be attributed to a group of young men called the macaronis (as mentioned in the song "Yankee Doodle"). These were young Englishmen who returned from Europe and brought with them new ideas about fashion from Italy. The French contemporaries of the macaronis were the incroyables. At this time, there was also much interest in the way to tie a proper cravat and this led to a series of publications. This began in 1818 the publication of with Neckclothitania, a style manual that contained illustrated instructions on how to tie 14 different cravats. Soon after, the immense skill required to tie the cravat in certain styles quickly became a mark of a man's elegance and wealth. It was also the first book to use the word tie in association with neckwear. By this time, the sometimes complicated array of knots and styles of neckwear gave way to the neckties and bow ties, the latter a much smaller, more convenient version of the cravat. Another type of neckwear, the Ascot tie, was considered de rigueur for male guests at formal dinners and male spectators at races. These ascots had wide flaps that were crossed and pinned together on the chest. From the Official Gazette U.S. Patent Office Vol. 324 July 1924 1,499,324 - 1,503,460 page 630 Necktie. Giuseppe F. Pinsuti, New York, N. Y. Filed Nov. 18, 1921. Serial No. 516,036 A four-in-hand tie comprising an end member, a loop at one extremity of the end member, and a body member, with one end thereof threaded through the said loop and turned back against the body member so that the body member and that portion thereof threaded through the loop form continuations of the end member whereby the body member may be folded over the end member and that portion of the body member which is threaded through the loop to form a knot which is slidable on both the end member and that portion of the body member threaded through the loop. This was until 1926, when a New York tie maker, Jesse Langsdorf came up with a method of cutting the fabric on the bias and sewing it in three segments. This technique improved elasticity and facilitated the fabric's return to its original shape. Since that time, most men have worn the "Langsdorf" tie. Yet another development during that time was the method used to secure the lining and interlining (known as the swan) once the tie had been folded into shape. Richard Atkinson and Company of Belfast claim to have introduced the slipstitch for this purpose in the late 1920s. After the First World War, hand-painted ties became an accepted form of decoration in the U.S. The widths of some of these ties went up to 4.5 inches (11 cm). These loud, flamboyant ties sold very well all the way through the 1950s. The Bold Look lasted until about 1951, when the "Mister T" look (so termed by Esquire magazine) was introduced. The new style, characterized by tapered suits, slimmer lapels, and smaller hat brims, included thinner and not so wild ties. Tie widths slimmed to 3 inches (7.6 cm) by 1953 and continued getting thinner up until the mid-1960s; length increased to about 52 inches (130 cm) as men started wearing their trousers lower, closer to the hips. Through the 1950s, neckties remained somewhat colorful, yet more restrained than in the previous decade. Small geometric shapes were often employed against a solid background (i.e., foulards); diagonal stripes were also popular. By the early 1960s, dark, solid ties became very common, with widths slimming down to as little as 1 inch (2.5 cm). The four-in-hand necktie (as distinct from the four-in-hand knot) was fashionable in Great Britain in the 1850s. Early neckties were simple, rectangular cloth strips cut on the square, with square ends. The term "four-in-hand" originally described a carriage with four horses and a driver; later, it also was the name of a London gentlemen's club, The Four-in-Hand Driving Company founded in 1856. Some etymologic reports are that carriage drivers knotted their reins with a four-in-hand knot (see below), whilst others claim the carriage drivers wore their scarves knotted 'four-in-hand', but, most likely, members of the club began wearing their neckties so knotted, thus making it fashionable. 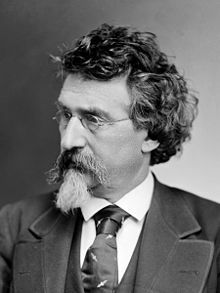 In the latter half of the 19th century, the four-in-hand knot and the four-in-hand necktie were synonymous. As fashion changed from stiff shirt collars to soft, turned-down collars, the four-in-hand necktie knot gained popularity; its sartorial dominance rendered the term "four-in-hand" redundant usage, shortened "long tie" and "tie". Four-in-hand ties are generally made from silk or polyester and occasionally with cotton. Another material used is wool, usually knitted, common before World War II but not as popular nowadays. More recently,[when?] microfiber ties have also appeared; in the 1950s and 1960s, other manmade fabrics, such as Dacron and rayon, were also used, but have fallen into disfavour. Modern ties appear in a wide variety of colours and patterns, notably striped (usually diagonally); club ties (with a small motif repeated regularly all over the tie); foulards (with small geometric shapes on a solid background); paisleys; and solids. Novelty ties featuring icons from popular culture (such as cartoons, actors, or holiday images), sometimes with flashing lights, have enjoyed some popularity since the 1980s. A skinny tie is a necktie that is narrower than the standard tie and often all-black. Skinny ties have widths of around 2 1⁄2 inches (6.4 cm) at their widest, compared to usually 3–4 inches (7.6–10.2 cm) for regular ties. Skinny ties were first popularized in the late 1950s and early 1960s by British bands such as the Beatles and the Kinks, alongside the subculture that embraced such bands, the mods. This is because clothes of the time evolved to become more form-fitting and tailored. They were later repopularized in the late 1970s and early 1980s by new wave and power pop bands such as the Knack, Blondie and Duran Duran. Early illustration of a pre-tied clip-on tie. 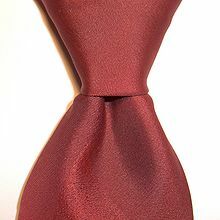 The "pre-tied", or more commonly, the clip-on, necktie is a permanently knotted four-in-hand or bow tie affixed by a clip or hook, most often metal and sometimes hinged, to the shirt front without the aid of a band around a shirt collar; these ties are close relatives of banded pre-tied ties that make use of a collar band and a hook and eye to secure them. The clip-on tie sees use with children, and in occupations where a traditional necktie might pose a safety hazard, e.g., law enforcement, mechanical equipment operators etc. (see § Health and safety hazard below). 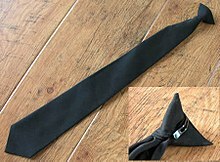 a solid black clip-on tie. many efforts ... in the past to provide a satisfactory four-in-hand tie so ... that the wearer ... need not tie the knot ... had numerous disadvantages and ... limited commercial success. Usually, such ties have not accurately simulated the Windsor knot, and have often had a[n] ... unconventional made up appearance. Frequently, ... [they were] difficult to attach and uncomfortable when worn ... [and] unduly expensive ... [offering] little advantage over the conventional. The Inventor proceeded to claim for the invention—the latest version of a 1930s–1950s product line from former concert violinist Joseph Less, Iowan brothers Walter and Louis, and son-in-law W. Emmett Thiessen evolved to be identifiable as the modern clip-on—"a novel method for making up the tie ... [eliminating] the neckband of the tie, which is useless and uncomfortable in warm weather ... [and providing] means of attachment which is effective and provides no discomfort to the wearer", and in doing so achieves "accurate simulation of the Windsor knot, and extremely low material and labor costs". Notably, the company made use of ordinary ties purchased from the New York garment industry, and was a significant employers of women in the pre-war and World War II years. In the late 1990s, two researchers, Thomas Fink and Yong Mao of Cambridge's Cavendish Laboratory, used mathematical modeling to discover that 85 knots are possible with a conventional tie (limiting the number "moves" used to tie the knot to nine; longer sequences of moves result in too large a knot or leave the hanging ends of the tie too short). The models were published in academic journals, while the results and the 85 knots were published in layman's terms in a book entitled The 85 Ways to Tie a Tie. Of the 85 knots, Fink and Mao selected 13 knots as "aesthetic" knots, using the qualities of symmetry and balance. Based on these mathematical principles, the researchers came up with not only the four necktie knots in common use, but nine more, some of which had seen limited use, and some that are believed to have been codified for the first time. the Nicky knot: an alternative version of the Pratt knot, but better-balanced and self-releasing (Lo Ci Ro Li Co T, Knot 4). 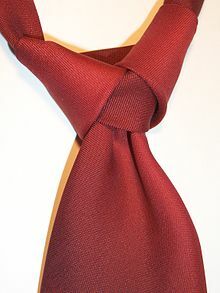 Supposedly named for Nikita Khrushchev, it tends to be equally referred to as the Pratt knot in men's style literature. This is the version of the Pratt knot favored by Fink and Mao. Biologist Gertrude Van Wagenen wearing a suit & tie. Neckties are sometimes part of uniforms worn by women, which nowadays might be required in professions such as restaurants and police forces. In many countries, girls are nowadays required to wear ties as part of primary and secondary school uniforms. Ties may also be used by women as a fashion statement. During the late 1970s and 1980s, it was not uncommon for young women in the United States to wear ties as part of a casual outfit. This trend was popularized by Diane Keaton who wore a tie as the titular character in Annie Hall in 1977. In 1993, neckties reappeared as prominent fashion accessories for women in both Europe and the U.S. Canadian recording artist Avril Lavigne wore neckties with tank tops early in her career. Traditionally, ties are a staple of office attire, especially for professionals. Proponents of the tie's place in the office assert that ties neatly demarcate work and leisure time. The theory is that the physical presence of something around your neck serves as a reminder to knuckle down and focus on the job at hand. Conversely, loosening of the tie after work signals that one can relax. However, some tech companies have gone the other way and banned neckties in the office, such as in Google[dubious – discuss], Amazon, Apple, and Ikea. Richard Branson, founder of Virgin Group, believes ties are a symbol of oppression and slavery. Outside of these environments, ties are usually worn especially when attending traditionally formal or professional events, including weddings, important religious ceremonies, funerals, job interviews, court appearances, and fine dining. A symbol for not wearing a tie. In the UK, it is a popular prank to pull someone's tie so that it tightens. This prank, known as peanutting or "squatknotting", is often used to embarrass the victim and can also be used for more severe bullying. In March 2008, a 13-year-old boy from Oxted, in Surrey, was rushed into hospital with spinal injuries after being "peanuted". He was kept in hospital for three days. 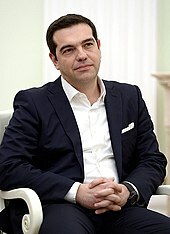 Alexis Tsipras and Banisadr, two examples of politicians who typically do not wear ties. In the early 20th century, the number of office workers began increasing. Many such men and women were required to wear neckties, because it was perceived as improving work attitudes, morale, and sales. Removing the necktie as a social and sartorial business requirement (and sometimes forbidding it) is a modern trend often attributed to the rise of popular culture. Although it was common as everyday wear as late as 1966, over the years 1967–69, the necktie fell out of fashion almost everywhere, except where required. There was a resurgence in the 1980s, but in the 1990s, ties again fell out of favor, with many technology-based companies having casual dress requirements, including Apple, Amazon, eBay, Genentech, Microsoft, Monsanto, and Google. In western business culture, a phenomenon known as Casual Friday has arisen, in which employees are not required to wear ties on Fridays, and then—increasingly—on other, announced, special days. Some businesses have extended casual-dress days to Thursday, and even Wednesday; others require neckties only on Monday (to start the work week). At the furniture company IKEA, neckties are not allowed. For 60 years, designers and manufacturers of neckties in the United States were members of the Men's Dress Furnishings Association but the trade group shut down in 2008 as a result of declining membership due to the declining numbers of men wearing neckties. Tie press, a device used to combat creasing in ties without heat-related damage. ^ Agins, Teri (August 1, 2012). "When Is it Time to Loosen the Tie?". Wall Street Journal. ^ a b "The Evolution of the Necktie". tie-a-tie.net. August 14, 2013. ^ "Academia Cravatica". Academia-cravatica.hr. Archived from the original on February 15, 2012. Retrieved January 6, 2012. ^ 18TH OCTOBER – THE CRAVAT DAY! Archived July 30, 2013, at the Wayback Machine. Academia-cravatica.hr (October 18, 2003). Retrieved on 2013-08-08. ^ Tie Talk. Tietalk.vpweb.com.au (June 30, 2010). Retrieved on 2013-08-08. ^ Chenoune, Farid (1993). A History of Men's Fashion. Paris: Flammarion. pp. 37–40. ISBN 978-2-08-013536-0. ^ Gemma, Pierre (1983). Da quando? Le origini degli oggetti della vita quotidiana (in Italian). Edizione Dedalo. p. 88. ISBN 978-88-220-4502-7. Retrieved October 11, 2010. ^ Murphy, H. Lee (January 2, 2012). "In a bind about tie widths? Skinny is in, but anything goes". Crain's Chicago Business. ^ Pareles, Jon (April 5, 2005). "Nostalgia for the Skinny Tie as Duran Duran Returns". The New York Times. The New York Times Company. Retrieved February 4, 2009. ^ a b Less, Joseph W (1957) U.S. Patent 2,804,627 "Pre-tied neckties and methods for making the same". ^ a b The beginning of the effort apparently was a version that used a pre-knotted design and slipped the tie's narrow end through "slot" in back of the knot. Clinton County Historical Society (2003). Clinton, Iowa. Arcadia Publishing. pp. 117–. ISBN 978-0-7385-2349-1. ^ Fink, Thomas; Yong Mao (November 5, 2001) [October 3, 2000]. The 85 Ways to Tie a Tie: the science and aesthetics of tie knots (1st Paperback ed.). New York, NY: HarperCollins. ISBN 1-84115-568-3. ^ a b "The Finest Neckties". Forbes. 26 November 2016. ^ Roetzel, Bernhard (1999). Gentleman: a timeless fashion. Könemann. p. 72. ISBN 3-8290-2029-5. ^ Dickinson, Rachel J. (June 18, 2004). "Ties have a history of hanging around." The Cincinnati Post. ^ Sagert, Kelly Boyer (2007). The 1970s. Greenwood. p. 101. ISBN 0-313-33919-8. ^ Peterson, Amy T. (2008). The Greenwood Encyclopedia of Clothing Through American History 1900 to the present. Greenwood Press. p. 360. ISBN 0-313-33395-5. ^ "Calender." Seventeen Nov. 2002: 24. ^ Pendergast, Sara; Tom Pendergast; Sarah Hermsen (2004). Fashion, Costume, and Culture. Clothing, Headwear, Body Decorations, and Footwear Through the Ages. Detroit: UXL. pp. 950–951. ISBN 0-7876-5422-1. ^ Kirkham, Pat (1999). The Gendered Object (2nd ed.). Manchester University Press. p. 164. ISBN 0-7190-4475-8. ^ a b "Why every man should wear a tie to work". Telegraph.co.uk. Retrieved 2016-12-02. ^ "Why Richard Branson Won't Wear a Tie". Bloomberg News. Retrieved 2016-12-02. ^ "Should I Wear A Tie? | Eminence Cufflinks". Eminence Cufflinks. 2016-05-15. Retrieved 2016-12-02. ^ Kuhn, W. (January 1999). "Violence in the emergency department: Managing aggressive patients in a high-stress environment". Postgraduate Medicine. 105 (1): 143–148. doi:10.3810/pgm.1999.01.504. PMID 9924500. Archived from the original on May 30, 2006. Retrieved June 8, 2006. ^ Teng, C; R Gurses-Ozden; J M Liebmann; C Tello; R Ritch (August 2003). "Effect of a tight necktie on intraocular pressure". British Journal of Ophthalmology. 87 (8): 946–948. doi:10.1136/bjo.87.8.946. PMC 1771792. PMID 12881330. Retrieved June 8, 2006. ^ Nurkin, Steven; Carl Urban; Ed Mangini; Norielle Mariano; Louise Grenner; James Maurer; Edmond Sabo; James Rahal (May 2004). "Is the Clinicians' Necktie a Potential Fomite for Hospital Acquired Infections?". Paper presented at the 104th General Meeting of the American Society for Microbiology May 23–27, 2004, New Orleans, Louisiana. p. 204. ^ Satter, Raphael; Lindsey Tanner (September 17, 2007). "U.K. Hospitals Issue Doctors' Dress Code". Retrieved September 19, 2007. ^ Boy was in hospital after 'peanut' tie prank. Daily Mail. March 31, 2008. ^ Killela, Amanda (26 February 2016). "Are ties an outdated fashion or do they still show that you mean business?". Mirror. Archived from the original on March 2, 2016. Retrieved 13 August 2016. ^ Ignatius, David (July 10, 2008). Tehran's Definite 'Maybe'. The Washington Post. ^ Bragg, Roy (May 24, 2003). "Tying one on in the office." San Antonio Express. ^ Smith, Ray A. (June 4, 2008). "Tie Association, a Fashion Victim, Calls It Quits as Trends Change". Wall Street Journal. pp. A1. Retrieved June 7, 2008.